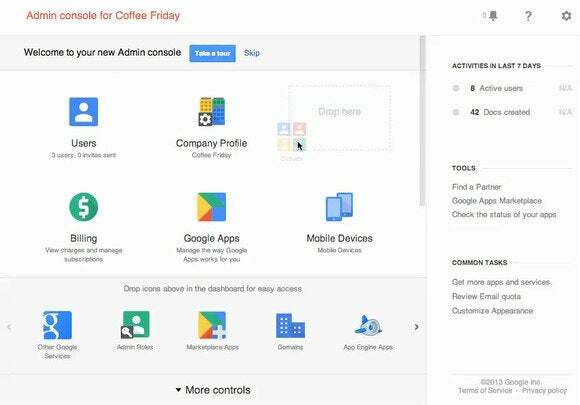 Google is rolling out a new IT administration console for its Apps email and collaboration cloud suite and for other enterprise products such as Maps Coordinate and Chrome OS devices. The console’s interface now has what Google describes as “a cleaner look” as well as improved navigation meant to be simpler and more intuitive. Also new is the ability for IT administrators to customize certain elements of the console, such as rearranging control settings icons in the tool’s dashboard, Google said on Wednesday. Google also has re-grouped some features into what it considers more logical sets, whereas before they were more dispersed and harder to find. Other improvements include a new universal search bar and more analytics data about users and applications. The overarching goal is to make it easier for IT administrators to perform tasks such as provisioning user accounts, managing mobile devices and configuring access to the various components of the Apps suite. Google has made the new console available to new Apps customers since mid-April and will roll it out to existing enterprise customers over the coming weeks. The company posted a video explaining the changes.